It's January, so that means that you've probably set a resolution to eat healthier and exercise more. I know I have, though I don't like to think of it as a resolution because resolutions usually get broken, and I'm hoping that doesn't happen for me. I'm using my upcoming anniversary trip to Hawaii as motivation to stick with it and make this more of a life change. 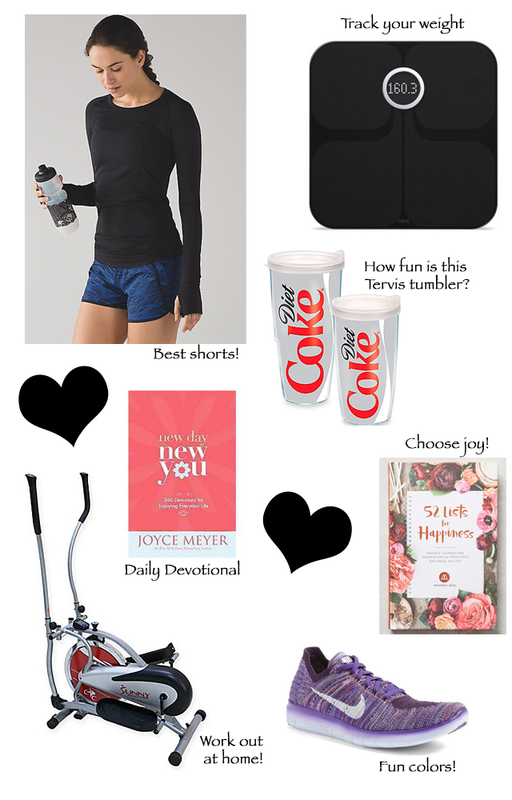 With that being said, this week's Friday Favorites are all somewhat geared towards living a healthier lifestyle. I wish I was one of those people who enjoyed working out, but I'm not. I grew to like it prior to adopting Carter when my friend Erin and I would go to the hip hop and yoga workout classes at LA Fitness together, but with the birth of her son and Carter's adoption, we stopped going and I eventually cancelled my membership. We belong to the rec center in our community, and they offer some classes, so maybe someday soon I'll be able to talk a friend or two into joining me (it's more fun when you work out with friends), but for now I'm working out at home. We purchased an elliptical a few years ago, so I've been trying to work out on that at least four days a week. On days when it's nice outside I'll take our golden retriever, Beemer, for walks. We used to take family walks every night before bed, and I'm trying to work that back into our routine. Sophia and Carter enjoy doing yoga at night, so I join them when I can. 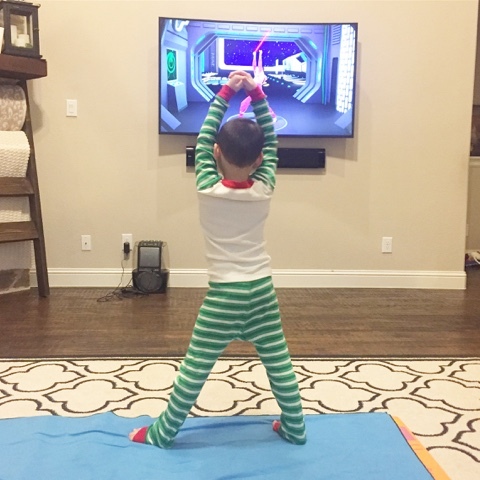 If you have kids, you should check out Cosmic Kids Yoga on YouTube - both kids love it! I also picked up the Fitbit Aria Scale, which I love. It's connected to my Fitbit account, and tracks my weight for me. Prior to buying it I told myself that a scale wasn't necessary - I didn't need to see a number on a scale to know whether I needed to lose weight/exercise more, which I still think is true, but it does feel good to step on the scale and see that the number is going down (or, at least, that it isn't going up!). I think part of my frustration with scales was that the ones I purchased never seemed to be accurate - when I'd go to the doctor the number was always higher there (while I preferred the lower number I was seeing at home, I wanted something that was accurate). So far the Aria scale has been the same as what I'm seeing at the doctor, and we've had it over a year now, so I'd definitely recommend it if you're looking for something a little more high tech. When you workout, you need to be dressed for it, right? There's just something about having cute workout wear that makes working out seem better. Le Mystère makes my favorite bra, so when I saw that they made sports bras, I decided to give it a chance. It's very comfortable and supportive. It's designed for C-cup and up, so if you're an A or B cup you could get something a little cuter (like this or this). It's on the pricier side, though it seems that most bras are nowadways, so I'd suggest checking on Amazon for a deal. I'll usually just throw on a t-shirt over it, and add my Nike Half Zip if I'm going to be outside and it's cooler. The Lululemon Run Times Short *4-Way Stretch 4" are my favorite workout shorts! I have a few of Nike Tempo Shorts, but I like my Lululemon shorts better. The waistband is smoother and they're more attractive on. My sister-in-law has several pairs of tempo shorts as does Sophia and they look great on them, but they just look weird on me. I have two pairs of Nike 'Free Flyknit' Running Shoes and I absolutely love them! Up until getting my first pair of these, I didn't wear athletic shoes because they just never felt very comfortable to me. When we went to Disneyland the first time, I realized that I probably needed something a little sturdier than my flip flops, so I picked up a pair of Nike Frees. I really liked them, so when I needed a new pair I decided to stick with them, but when I went shopping I thought the design on the Flyknits was cuter, so I got those instead. I'm so glad I did because they are so stinking comfortable! And did I mention that everytime I wear them I get compliments on how cute they are? I don't wear mine with socks (I don't think you're supposed to - they're described as having a "snug, sock-like fit"), so being able to wash them is really important, and these wash and dry really well. They're not cheap, but every once in awhile you can find them on sale. If you're thinking about getting them, now is the time to snap them up! I have two fun colored ones, but I think I'm going to pick up a black pair for our trip to Hawaii this summer. Last year I shared that we had started ordering Blue Apron boxes in this post. I love it because it takes the guesswork out of what to cook for dinner! Up until this point, we've gone with the meals for two, but I just changed our subscription to the family meal plan. It's only two meals a week, as opposed to the three we were originally receiving, but that may end up being a good thing because with Michael's travel schedule, practices, school events, etc it was sometimes hard to cook all three meals (don't get me wrong, I make dinner almost every night, but I don't always have time to devote to the prep work that these meals require). I'm also counting on Sophia and Carter eating those meals, and they're both pretty picky, so two fights meals a week is probably plenty. If you'd like to try it, let me know in the comments below because I've got free meals I can share with you! I also just recently discovered the Skinnytaste blog. So far I've only made a few of her meals, but we've enjoyed everything we've tried so far. We have also used the Drop 10 Diet by Lucy Danziger, editor in chief of SELF magazine, as a guide to meal planning. I'm not necessarily on a diet (I had Mint Chocolate Chip ice cream for dessert last night! ), but I'm trying to be more aware of what I'm eating. The Drop 10 Diet is perfect for this because it truly isn't a specific diet, it's more focused on adding superfoods to your current plan. There are several recipes in the book, as well as on the SELF website, and we have incorporated some favorite recipes from the South Beach and Sonoma Diet books. I sit down each week and come up with our meals, which makes grocery shopping a lot easier. Here is a copy of a two week plan I created. If for some reason it doesn't work let me know in the comments below and I can email it to you. I'd love to say that I have given up Diet Coke, but I don't think that's ever going to happen. I have, however, cut back to one (okay, sometimes two) a day, and am drinking more water. I find that if I have a big tumbler I can refill throughout the day I tend to drink more. I picked up this daily devotional and have been trying to be more purposeful about taking time out of each day to read and pray. I also picked up this journal, which has helped me to refocus and be thankful for the things I have. It's important to focus just as much on your mental health as your physical health. I've also started reading for pleasure more. You can read more about some of the books I've recently read here. I just discovered that our library is connected to Overdrive which allows me to check out eBooks and read them on my phone, so I'm debating whether it makes sense to buy a Kindle or not. I really enjoy holding a book in my hand, but I like the idea of being able to immediately check out/download a new book when I finish one and am not in love with reading on my phone (I'd like something a little bigger), so I'm considering getting a Kindle. If you have an eReader, which one do you have? Would you recommend it? Thanks in advance for your help! I'd love to hear what you're doing to stay healthy this year! I've always loved reading, but lately I seem to go long stretches where I won't read at all, and then I'll pick up a new book and read it in two days! I love hearing about good books other people have read, so I thought I'd share some of my recent reads! 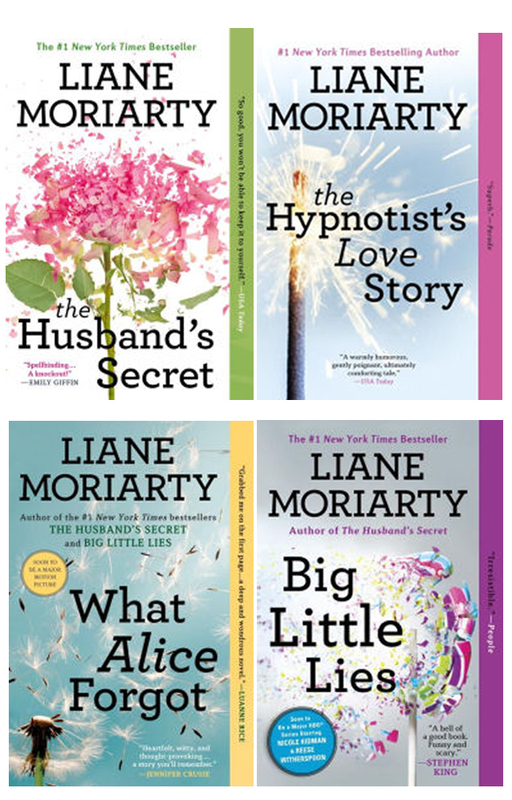 Four of the six books are by Liane Moriarty, who has quickly become one of my favorite authors! I know I should probably change it up a little bit, but when I find something I like I stick with it. 1. The Husband's Secret - This is the first Liane Moriarty book I read. A woman finds a letter from her husband that is meant to be found and read after his death. She struggles with whether to open it now, but eventually does and is shocked by what she reads. At the same time you meet a woman whose husband leaves her for her cousin, who also happens to be her best friend, so she moves home to Sydney with her son to live with her mother. She ends up meeting and falling for a man who the school secretary suspects got away with murdering her daughter 30 years ago. Moriarty does a great job of leaving the reader in suspense and weaving three separate stories that all intertwine in some way. I loved it, so I immediately went out and bought another of her books. 2. The Hypnotist's Love Story - Ellen finally meets the perfect man, but it turns out he's being stalked by a crazy ex-girlfriend. Even though it does involve a stalker, she doesn't go all Fatal Attraction on her and boil her bunny - in fact, at one point the stalker breaks into Ellen's house and bakes for her. It's interesting to see how the story plays out. 3. What Alice Forgot - When I first saw this book on the shelf, I thought it had something to do with the movie Still Alice. It doesn't. It's about a lady who falls and hits her head at the gym and when she wakes up she's forgotten the last ten years of her life. She thinks she's 29 and pregnant with her first child, blissfully in love with her husband. She's actually 39, has three kids, and is separated from her husband. It's interesting to watch her navigate her way through her "new" life while longing for the only life she knows. So good! 4. The French War Bride - I decided to branch out and read something other than a Liane Moriarty book. The title and the picture on the cover imply that it's a love story, but it's not. This story weaves back and forth between the past (WWII France) and present (Wedding Tree, Louisiana) as Amélie tells Kat the story of how she was able to "steal" her fiancé during the war. Amélie shares with Kat the dark history of the Nazi occupation of Paris and how she came to meet and marry Jack, Kat's fiancé. Every time I read historical fiction, I love it, and this book was no different. I really don't know why I don't read more of it. 5. Big Little Lies - It didn't take long for me to find another Liane Moriarty book I wanted to read. When I heard that HBO was creating a limited series based on the book, I knew that I needed to read it. A school trivia night ends with a death, and the book takes you back six months prior to the trivia night and introduces you to all the characters/suspects. It's a great book, and you're left in suspense the whole time. I literally couldn't put it down! 6. The Woman in Cabin 10 - This book was okay. It's a mystery/suspense/thriller, which isn't a genre I frequently choose, but it sounded good and I needed a new book to read, so I decided to go out of my comfort zone a little. It started off slow, but then I got sucked in and couldn't put it down! It was a quick and easy read, but definitely not my favorite of the books I've read recently. I can't quite put my finger on why, but I don't think I'll be reading another Ruth Ware novel. Now that I've finished The Woman in Cabin 10 I'm looking for something new to read. What are you reading right now? It's time for some more of my favorite things! This week's list is totally random, but I decided to just go with it. Oral-B Pro-Health Pulsar Toothbrush Yes, a toothbrush. But this isn't just any toothbrush, it's an affordable alternative to an electric toothbrush. It has vibrating bristles! And did I mention it's less than $5? When I went to the dentist a few weeks ago the dental hygienist asked if I'd gotten a Sonicare because my teeth looked so good! Olay Regenerist Luminous Brightening Cream Face Cleanser I just started using this again when I noticed that the Murad Time Release Acne Cleanser I normally used wasn't working well for me with the dryer weather. My forehead felt weird (the skin wasn't smooth anymore, it was bumpy and dry) and my face was red and dry in certain areas, so I decided to change my cleanser. Clarisonic Mia I was on the fence about this, but ended up ordering it during the Nordstrom Anniversary Sale. When I got it I used it a few times a week and liked it, but wasn't overly impressed. When I noticed how dry my skin was getting I started using it again, and that night I could already see a difference in the texture of my skin (remember the weird forehead issues?). The Mia comes with the sensitive brush head, so it's really gentle on your skin. I've been using it more frequently and my skin looks and feels so much better! Origins VitaZing Lately I've gone back to a more natural makeup look, and I've been reloving my VitaZing tinted moisturizer. It's lightweight so I don't feel like I'm wearing any makeup, but it's tinted so it evens out my skintone and makes it look fresh and luminous. DV Jameson Bootie I have a pair of Dolce Vita booties that I got from Nordstrom a few years ago that I really like, so when I saw that Dolce Vita had partnered with Target I knew I had to check them out! I ended up getting a pair of these in cognac along with a pair of slip on booties in August and the cognac booties have been my most worn shoe all fall and winter (except for those few days when it got really cold). I liked them so much I decided to pick up the black ones in December. They're on sale right now for $19.99, so now is definitely the right time to buy! They run a little small (at least for me), so I'd recommend going up a half size. Barefoot Dreams CozyChic Robe I got this robe as a birthday gift and I love it! It is so cozy and warm, and I love to wrap up in it while I get ready in the morning! I love it so much that I ended up asking for this blanket for Christmas! Like I said last week, I have some fun posts planned, but if there is anything specific you'd like to see, let me know in the comments below. Talk to you soon! I'm sorry I've been MIA for the past few months. I subbed a lot between Thanksgiving and Christmas, and then with the kids and Michael being home over the holidays we were just busy! I've got some fun posts coming up, though, so that's good. I haven't done a favorites list in awhile, and another blogger I follow posts her "Friday Favorites," so I thought that would be a fun way to jump back into blogging. I can't promise it will be a weekly thing, but I'll do my best! ALTERNA Caviar Anti-Aging Replenishing Moisture Shampoo & Conditioner Since I started using this shampoo and conditioner, my hair looks and feels healthier, and I think that it's growing faster! Maybe it's just wishful thinking on my part, but it's definitely a duo I'll be repurchasing. Moroccanoil Treatment My hair is silkier, and again, it looks and feels healthier. This is also great for all of those flyaways and baby hairs I used to tame with clear mascara (this works way better and my hair doesn't get crunchy). Hot Tools Tourmaline IONIC Professional Dryer This is the most money I could justify spending on a hair dryer ($85), but as soon as I picked it up I knew I had to buy it - so light! Trish McEvoy 'High Volume' Mascara This is the coolest mascara. It stays put during the day, and when you're ready to take it off you just wet a wash cloth with warm water and dampen the lashes. The mascara literally slides off your lashes! L'Occitane Shea Butter Hand Cream I have eczema and my hands get really dry during the winter months. I started using this at Christmas and, while my hands aren't perfect, they aren't cracking and bleeding like they normally are. There are a few dry patches, but I think with more use those will go away too. Chanel Rouge Coco Baume Hydrating Conditioning Lip Balm I love how soft my lips are with this lip balm, and it's Chanel so that makes it feel a little fancy (I think that Chanel beauty products are the only things I'll ever be able to afford!). Clinique 'Moisture Surge Intense' Skin Fortifying Hydrator Winter seems to be the time to moisturize, moisturize, moisturize! My face was really dry, so I started using this gel moisturizer and it's amazing how silky smooth my skin has become. I use it in the morning before I put on my makeup and at night after cleansing. I was worried I might breakout due to the intense moisture, but that doesn't seem to be an issue. 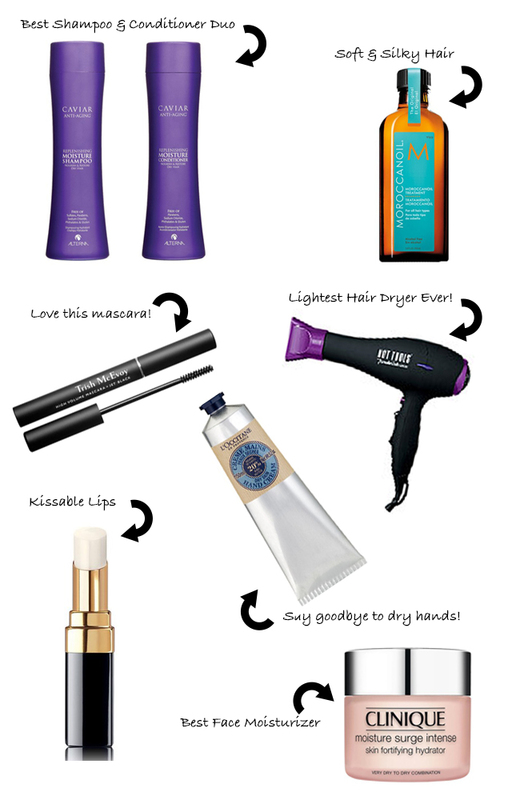 POPSUGAR sent me the December Must Have Box to try, and I have to say that I love it! I mean, who doesn't love getting presents? I love that all of the products are full-sized and that there is a mix of fashion, beauty, home, and more included in each box. Sophia and Carter were so excited when they came home from school today to fresh baked chocolate chip cookies, courtesy of Sisters' Gourmet! The Odeme Catchall + Ring Dish is perfect for holding my jewelry each night when I go to bed, and it looks so cute sitting on my mirrored nightstand! Order your box here and use the code SHOP5 for $5 off! The first Liane Moriarty book I read was The Husband's Secret. I loved it, so I immediately went out and bought another one of her books. At this point I've read four of her books and I've loved them all! I'm excited because Big Little Lies is actually going to be a limited series on HBO starting in February! I'm planning a book review post soon, so I'll share more details on all four books then, but I'd definitely recommend her books! I hope that you had a very Merry Christmas and are having a great year so far! Talk to you soon!